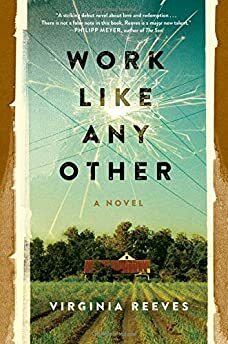 Largehearted Boy: Book Notes - Virginia Reeves "Work Like Any Other"
Book Notes - Virginia Reeves "Work Like Any Other"
Virginia Reeves' novel Work Like Any Other is an engrossing and eloquent debut. "This is a consummately well-written, deeply affecting, thought-provoking American historical novel of hard labor, broken dreams, moral dilemmas, violence, racism, and the intricacies of marriage, parenthood, and friendship. Hope is found in reading, compassion, forgiveness, and good, honest work, whatever form it takes. Reeves’ gripping, dynamically plotted, and profound novel will resonate on different frequencies for men and women and spark soul-searching and heated discussion." The story of Brown Bird is beautiful and tragic. Watching Dave Lamb and MorganEve Swain was akin to watching Gillian Welch and Dave Rawlings—their love for each other alive and brilliant in their music, tangible, vibrant. I saw them play in a tiny vintage clothing store / wig shop / hair salon during Austin's infamous SXSW years and years ago. And then, Dave got sick, and in April, 2014, he succumbed to leukemia. He spent his last year writing music. "Fingers to the Bone" is on their 2011 album, and it's on this playlist because of the tribute it pays both to work and to rest. "Work is what you are when you're breathing in and out til your final breath falls to the floor." The song is challenging us to get up and do the work, whatever it is. Someday, there will be rest, but not yet, so you best get to it. Another powerful duo, Shovels and Rope is the husband and wife team of Michael Trent and Cary Ann Hearst. There's a YouTube video of them singing this song together that guts me every time I watch it. So many of my characters are alone and lonely in this book, and this is a song about the pain of separation and detachment. The future is hypothetical: "If you get too lonely, I will follow you around in this tune." It may never get too lonely, and even if it does—the people in the song will only be united in the music, the fantasy. There is hope of reconciliation at the very end, but it still feels ethereal. This song is about resilience in the face of adversity. It's a middle finger to God and fate and society. "I'll build my boat so tall and wide, and I won't be waiting on the river to rise," which is to say: I'm not going to wait around to drown, a sentiment embodied in many of my characters, but specifically in Roscoe, Marie, and Wilson—Roscoe when he brings in the power, Marie when she tries to put her life back together after Roscoe's imprisonment, and Wilson when he escapes the mines. Gillian Welch and Dave Rawlings conjure the feeling and tone of this novel more than any other musicians out there—that's why there are two of their songs on this list. Also, they're my favorite musicians. The first time I saw them live, my husband and I drove to Olympia, Washington, from our home in Helena, Montana, and left our baby daughter with an old friend she'd never met whose wife was out of town and whose house was blisteringly cold. Zero regrets. It was the last show of their tour. Old Crow Medicine Show opened for them. Both bands played good, long sets, and then, at the end, Gillian said, "It's been such a pleasure playing with these guys. Ya'll can go on home, but we're going to call them back up here and play some more." So, we got to see them all play together. One of the songs they played was The Band's "The Weight," and it remains the best live music performance of my life. Anyway, this particular song is included because it is a song about work and connection to that work. Ranging from an old man and his mule to ragtime kings and their horns, the words try to fend off the hard times that come with work. The old man sings to his mule, "Come on my sweet old girl, I'd bet the whole damn world, we're gonna make it yet to the end of the row." But he loses his song when he loses the mule, and the ragtime kings are asked to lift up their voices in his place. "So come on you ragtime kings, come on, you dogs, and sing." There's hope in this song, if only a glimmer. The refrain of this song goes, "Now, you know I wouldn't fight, if these guys wouldn't shove me." My novel is interested in guilt and responsibility, the ownership of wrongs. This song dodges those, or at least complicates them. There are always sets of extenuating circumstances, which is something my book explores. This could be Roscoe's song, or Marie's, Moa's, Wilson's. It could be Ed's even, or Taylor's. This song says: Yeah, I did that thing, but my actions aren't the only ones worth noting. I have a great fondness for this one. My husband and I saw Two Gallants perform at the Mohawk in Austin, a great small venue. Most of their music is faster, but for this song, they left the stage and came out in the crowd with their instruments—guitar and tambourine and great gorgeous voices. There are so many moments in it that speak to me of Roscoe and Marie's distance and pain, but also the inevitability of their reunion, brief and tortured as it might be. "Everything that blows away, soon is gonna come back home…"
A worried mind, a sleepless night, a heavy-headed girl—this song could be playing during any number of scenes in my book. I can't help but see Roscoe's electrical line when with this song's speaker is "walkin' down the line," or Ed's release from prison the sleepless night the State electrocutes Horace DeVaughn. I've been following The Devil Makes Three for well over a decade and saw them perform one summer in a basement pool hall with horrible ventilation (the club they were scheduled to play in caught fire earlier in the day). They're amazing live, and there's not a song they've recorded that I don't like. Of all their songs, though, this one has the most of Roscoe in it. It's his as a boy trying to escape his father's home, as a young man captivated by electricity, as a husband and a father—troubled and angry. It's his prison song, too, and it captures the displacement he feels throughout his life, even when he's doing all he can to belong. "I can go back where I came from, but I ain't ever going home." Again, this is a song for and of Roscoe, but right at the start of the book. It shouts his early frustrations and wallows in his pride. Ruby is Marie, and Roscoe is singing this song to her (though I'm sure his voice would pale in comparison to Rhiannon Giddens'). "I've done all I can do to try and get along with you, but still you're not satisfied." This is the Roscoe who shouts and breaks plates and bruises his son's arms, the man who refuses to work the farm. He can't see Marie's stance, and she can't see his. I don't think Ruby and her man are seeing eye-to-eye either. This song shows the other side of Roscoe's beautiful electricity—leveled land and forests, buried towns underneath lakes that back up to hydroelectric dams. It's a lament against progress, a narrative about exploitation, an elegy for all that's lost. It shows the great irony of individuals laboring toward unwanted ends—citizens of the town paid meager wages to help build the dam that will destroy their home. Pa is disinterred; Ma is moved fourteen miles away. I shook/grabbed Langhorne's hand when he jumped off the stage at Old Settler's Music Festival in 2015. I'm a big fan. I even got a troupe of my middle school students to perform one of his songs with me at a school assembly. I sang. They were my band. It was terrible. I knew I'd include a Langhorne song in here, and I chose this particular one because it's Marie's. It's the undercurrent of her actions, the reminder she needs to repeat. "I'm tired of being patient; all this waiting's been a waste of time." She waited on her husband, and that waiting took them backward. Still, she owns her part in it all. This isn't a blame-slinging song; it's an admission of guilt. "It's no wonder how we got here. In many ways I wrote this script…" The Marie I know understands her mistakes, and she is sorry. The refrain, "I tried to hold you, but my hands were cold," is so tragic to me, and I can hear Marie saying it. She tried to be warm, but she just couldn't. The cold was too deep. She was too damaged. And I like to think that she saw some salvation in Roscoe's eyes there at the end, that she recognized what was there, even if it wasn't hers to share anymore. This is everyone's song. It is the book's song. It is a ballad devoted to work and labor. "You may not go to the job in the ground, but you learn the miner's refrain." Everyone knows the hardship, the toil, the pain. I can see all of my characters singing this song together. It's playing when Wilson returns, when Moa steps out on the porch to confront Roscoe, when Marie meets the man from Alabama Power, when Gerald sees his father for the first time in nine years; it's playing in Kilby prison, always.